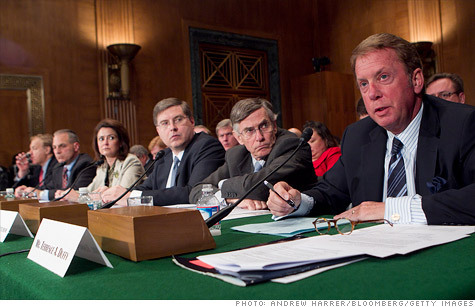 Terry Duffy, the head of exchange operator CME Group, testifies about the collapse of MF Global on Capitol Hill Tuesday. NEW YORK (CNNMoney) -- Investigators probing the collapse of bankrupt brokerage MF Global said Tuesday that they have located the $1.6 billion in customer money that had gone missing from the firm. But just how much of those funds can be returned to the firm's clients, and who will be held responsible for their misappropriation, remains to be seen. James Giddens, the trustee overseeing the liquidation of MF Global Inc, told the Senate Banking Committee on Tuesday that his team's analysis of how the money went missing "is substantially concluded." "We can trace where the cash and securities in the firm went, and that we've done," Giddens said. MF Global failed last year after its disclosure of billions of dollars worth of bets on risky European debt sparked a panic among investors. About $105 billion in cash left the firm in its last week, Giddens said, as clients withdrew their funds and trading partners called for increased margin payments, leaving the firm scrambling to make good on its obligations. It has since emerged that MF Global tapped customer funds for its own use during this crisis and failed to replace them, in violation of industry rules. Roughly $700 million of the missing money is now locked up with MF Global's subsidiary in the United Kingdom, where Giddens and his team are engaged in litigation to have it returned to U.S. customers. Giddens said he is "reasonably confident" that these funds will be recovered, though he added that it will be a lengthy process with no guarantee of success. Another $220 million was transferred inadvertently from the accounts of securities customers to those of commodities customers. That money is now in limbo amid a dispute over which customers it belongs to, said Kent Jarrell, a spokesman for Giddens. The final $680 million or so was transferred to other financial institutions with which MF Global did business, including a substantial portion that went to JPMorgan (JPM, Fortune 500). Giddens said his team has "a solid basis for seeking the recovery of some of the funds that were transferred to JPMorgan," and is engaged in ongoing talks on the issue. JPMorgan did not immediately return a request for comment. Giddens' team is just one among a number of groups probing MF Global's collapse. There's also Louis Freeh, the trustee for MF Global's parent company, as well as the Department of Justice and federal regulators including the Securities and Exchange Commission and the Commodity Futures Trading Commission. Jill Sommers, a commissioner with the CFTC, told the hearing Tuesday that she could not disclose details of the commission's investigation, but said the case could lead to enforcement actions against the company or the individuals involved. The SEC and CFTC can only seek civil penalties and restitution for customers, but their findings could help form the basis of a criminal case brought by the Justice Department. Giddens, for his part, has said he may file civil claims against MF Global executives alleging breach of fiduciary duties and violations of federal law governing commodities trading. A person familiar with the trustee's probe said Jon Corzine, a former U.S. senator and Democratic governor from New Jersey who was CEO of MF Global when it collapsed, is among those against whom Giddens is considering action. So far, most of MF Global's thousands of former customers have recovered about 70% of their money, while those that traded on foreign exchanges are missing nearly all of it. On Tuesday, a bankruptcy judge in Manhattan authorized an additional distribution of $685 million that will bring most customers up to around 80% of what they're owed. Six months after the firm's failure, however, they're still waiting for someone to be held accountable. "Crimes have been committed here without a doubt," said James Koutoulas, an attorney and trader who has been advocating on behalf of MF Global customers. "We think there are enough facts out here to start arresting people and start filing charges."